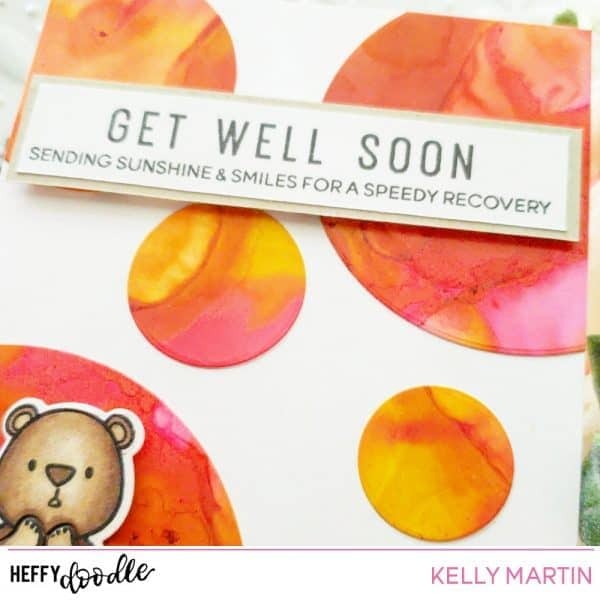 I’ve got a really simple card for you today that combines two of my favorite products: Heffy Doodle images and alcohol inks! I created an alcohol ink background and then used a nesting circle die set to cut out several circle pieces. I laid them around a cut and scored 4.25 x 5.5 inch card base, and then trimmed off the edges so that they were even with the card base. I stamped one of the bear images from the Unbearable Without You stamp set with a copic safe black ink. I colored my bear with copic markers and then used the matching die set to cut him out. I then glued him on to the bottom left alcohol ink circle. I used a sentiment from the Everyday Sentiment Duos and stamped it on a piece of white cardstock. I glued it on to a piece of light Kraft colored cardstock and then trimmed it down. To finish off the card, I mounted the sentiment piece with foam tape and then laid it down on the card.